Last Updated: September 20, 2018 | Subscribe to our weekly newsletter! Whether you’re just diving into owning a pool, or you have years of pool care experience, you need the right tools to properly clean and maintain your little slice of backyard paradise. But what pool supplies do you actually need? Before you run out to the nearest pool store and plunk down a big ol’ chunk of change, make sure you know what pool supplies are actually necessary. You’ll save yourself some money, and you’ll be ready to take care of your pool like a pro. It’s hard to practice good pool maintenance if you don’t have the tools to accomplish it. Stock up on a few essentials, and then build from there. There’s no point in owning a pool if it’s all drudgery. Having the right tools at hand will make your life a lot easier, and allow you to enjoy your pool much more. We cannot stress how incredibly important water testing is for your pool maintenance. It’s best to test your water at least once a week. Regular testing lets you know when you need to add chemicals to your pool to prevent nasty bacteria and algae from moving in. Sure, you could get your pool water tested at your local pool supply store. But do you really want to have to drive somewhere every time you need your water tested? We didn’t think so. Instead, stock up on test strips. They’re not quite as accurate as liquid test kits If you click this link and make a purchase, we earn a commission at no additional cost to you. (which you may also want to keep on hand), but they’re quick and easy to use If you click this link and make a purchase, we earn a commission at no additional cost to you. , and cover all the basic levels you need to keep track of: free chlorine, total chlorine, bromine (if you use that instead of chlorine), total hardness, total alkalinity, pH and cyanuric acid. All you have to do is hold the strip underwater for a few seconds, and compare the strip to a provided color graduation scale to get a reading. Outside of regular weekly testing at home, it’s still a good idea to take a water sample in for professional testing by your local pool store at least once a month. Your pool would be a pretty gross storehouse for human skin cells, oil, and other nasty microbes if it weren’t for pool chemicals. 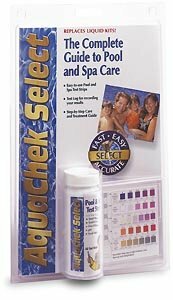 And of all the chemicals in your arsenal, pool shock is one of the most important to keep around. When your pool starts to smell like a hotel pool, it’s time to shock your water. Your pool actually shouldn’t smell like anything when the water is balanced. This chemical smell means your sanitizer level is too low and is no longer doing its job. Giving your pool a shock will bring sanitizer levels back up where they need to be, kill bacteria, and ensure your water is clean. It can also help address mild cases of algae. To accomplish all those things most effectively, choose a shock made from calcium hypochlorite If you click this link and make a purchase, we earn a commission at no additional cost to you. , or cal hypo. Prevent the dreaded hotel pool smell by shocking your water once a week, or at least once every other week. The more you use your pool, the more often you’ll need to shock it. You’ll also want to shock your pool after major water level changes, pool accidents involving someone’s bowels, severe rainstorms, or when you need to kill pool invaders like algae. Speaking of algae, this scourge of the swimming pool requires special care, so it makes sense to have special tools. When you’re dealing with a bad case of pool algae, the first step will be to scrub it off the pool’s surfaces. 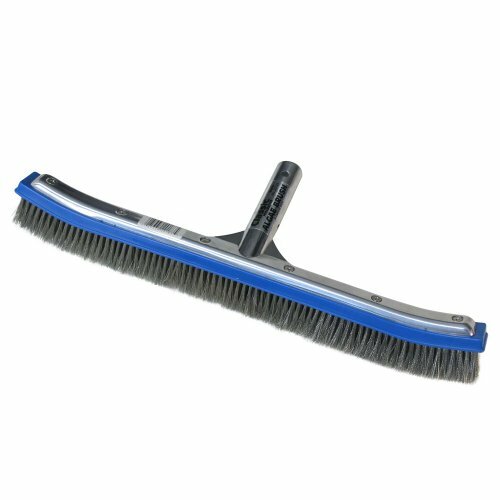 An algae brush has stainless steel bristles that will easily break algae’s hold If you click this link and make a purchase, we earn a commission at no additional cost to you. on walls, steps, and wherever else it may be hiding. It will save you a lot of time, and save your back. Important: Stainless steel algae brushes are best for concrete or gunite pools. Opt for a regular nylon bristle pool brush If you click this link and make a purchase, we earn a commission at no additional cost to you. if you have a vinyl liner to avoid damaging it. 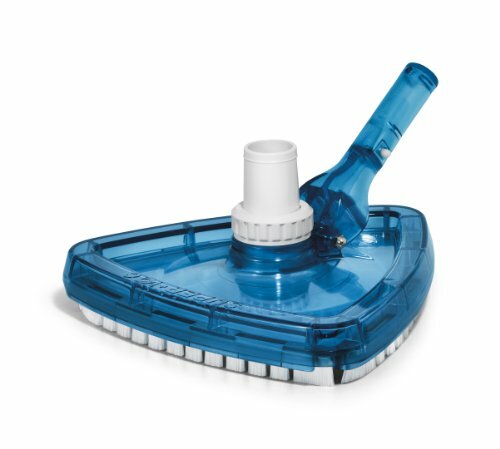 Like an algae brush, a manual vacuum can be a lifesaver in the event of an algae infestation. Once you’ve brushed the algae from your pool’s surfaces, you’ll need to remove it from the water, and the quickest way to do that is to vacuum it up. But this handy pool tool has plenty of other uses too. For one thing, it bypasses your filtration system, so if you’re dealing with storm or flocculant debris, you don’t have to worry about smaller pieces getting back into your water once you vacuum them out. 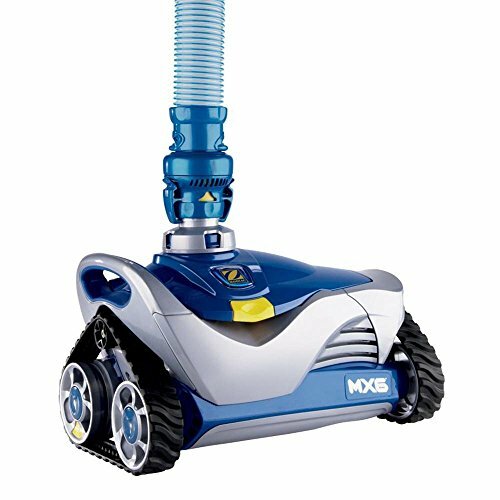 Another benefit of a manual vacuum is the control it offers If you click this link and make a purchase, we earn a commission at no additional cost to you. when you’re cleaning your pool. Sure, an automatic cleaner can save your time a muscle strain, but it might miss hard-to-reach spaces. A manual option in your pool supplies can help you spot-clean minor problem areas before they become major problem areas. Tip: To use a manual vacuum, you’ll also need a telescoping pole If you click this link and make a purchase, we earn a commission at no additional cost to you. and a vacuum hose If you click this link and make a purchase, we earn a commission at no additional cost to you. .
Nope, you’re not looking into the heavens with this particular pool supply. A telescoping pole simply means the pole extends like an old-fashioned telescope. This makes it great for reaching the depths of your pool without having to bend, and for taking up minimal space when you put it away. Telescoping poles are versatile cleaning support tools, especially since most come with the option for interchangeable heads If you click this link and make a purchase, we earn a commission at no additional cost to you. . This means you only need one pole to use a pool skimmer, manual vacuum, or pool brush. But the true benefit in this pole lies in its telescoping ability. Depending on the width of your pool, you won’t have to constantly walk around the deck to chase debris. You’ll also have the ability to shorten the pole for cleaning tasks that require a little less reach and more control, like vacuuming the pool steps. Warm water, plenty of sunlight, and potential food sources like your body oils are huge draws for bacteria and algae. While your water chemistry goes a long way to keeping these contaminants at bay, a regular cleaning schedule is essential. 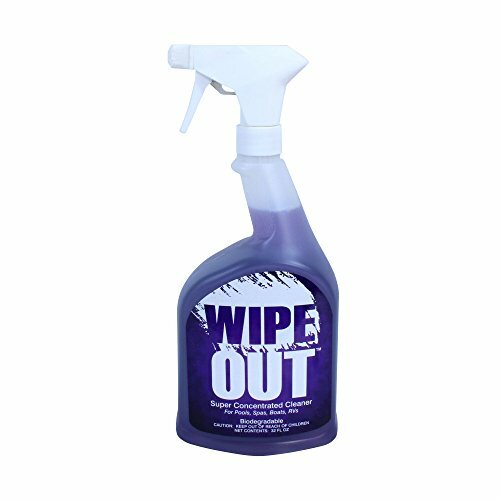 Make sure you choose something less harsh than other cleaning products, so it’s safe for use on sensitive vinyl, fiberglass, and even solar covers. The last thing you want to do is scratch or otherwise damage your pool or any of its accessories. A significant part of your water’s health is directly related to how well your pool’s filter functions. Despite all your best efforts, dirt and grime buildup in your filter is an unavoidable part of pool life. In fact, a little extra dirt might not hurt in some cases; collected dirt acts as an additional filtration layer for smaller particles trying to get through your system. Still, the time will come when your filter must be cleaned If you click this link and make a purchase, we earn a commission at no additional cost to you. in order to continue working the way it should. 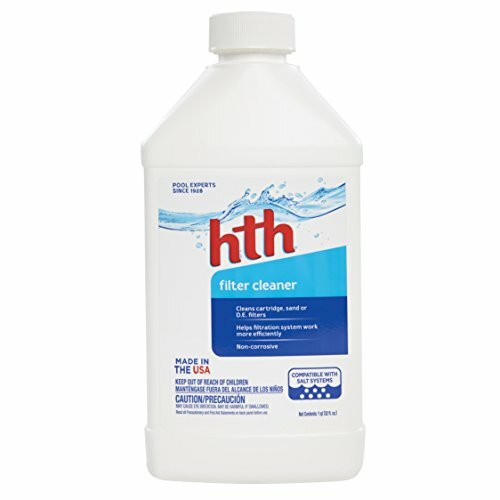 Filter cleaners help remove residue, prevent cloudy water, and improve the efficiency of your filter. The cleaning schedule will depends on how often you use your pool and the type of filter you have. Pay attention to your pressure gauge and your water clarity to determine whether your filter needs a good cleaning. If you’re not a fan of using a pool skimmer, you definitely don’t want to skip out on a pool cover. It can help keep all manner of nasty debris out of your pool. Trust us, a good pool cover will save you a ton of headaches and heartache later. When you close your pool for the winter, you add a significant amount of chemicals to maintain your water clarity and to prevent the growth of bacteria and algae. 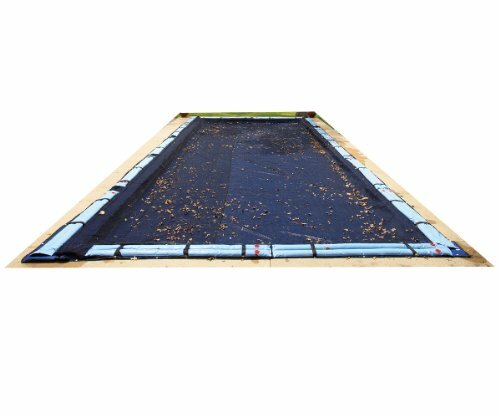 A pool cover will reduce the potential for water contamination and help protect your pool If you click this link and make a purchase, we earn a commission at no additional cost to you. until you reopen it. If you have a solid cover, you also don’t have to worry about your water level changing throughout the off season. Mesh covers allow for some drainage, but they keep debris and bugs out. Preventive pool supplies like pool covers can help take the stress out of reopening your pool once warmer weather rolls around. It’s the difference between scooping months-old leaves out of your water or jumping right into adding water and restarting your pump. OK, so you don’t absolutely need this one as long as you have a manual vacuum. But an automatic pool cleaner can save you a lot of time and effort If you click this link and make a purchase, we earn a commission at no additional cost to you. by helping to keep your pool clean, even when you’re not around. Think about it. You have a rough day at work, traffic on the way home is terrible, and all you want to do when you finally get home is take a refreshing dip in your clear, clean pool. Except, while you were at work, a bunch of leaves and other stuff blew into the water, so before you can relax and enjoy your pool, you have to vacuum it. Ugh. You may as well stay inside. But if you had an automatic cleaner zipping around the pool all day, you’d come home to clear water ready for you to dive in with no hassle at all. We think this makes it one of the most helpful pool supplies you can have in your pool care arsenal. 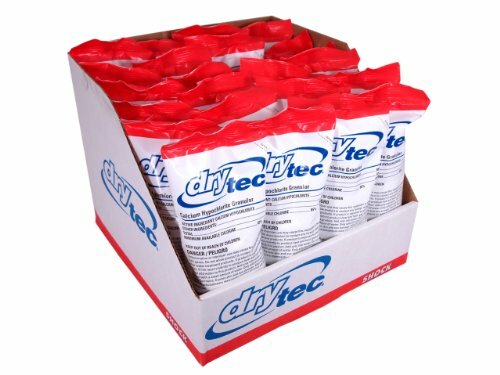 A lot of pool stores will have a ton of supplies they say you absolutely need to get the job done. And you may find other pool supplies later on that you can’t live without. We all have our own ways of handling pool maintenance with little tweaks here and there to reach the same end goal: a clean, healthy pool. You’ll certainly add to your stock of pool supplies as you become a more seasoned pool owner. Just make sure you have the essentials to keep your pool clean, and you’ll get a lot more enjoyment out of your investment. And isn’t that the way it should be?